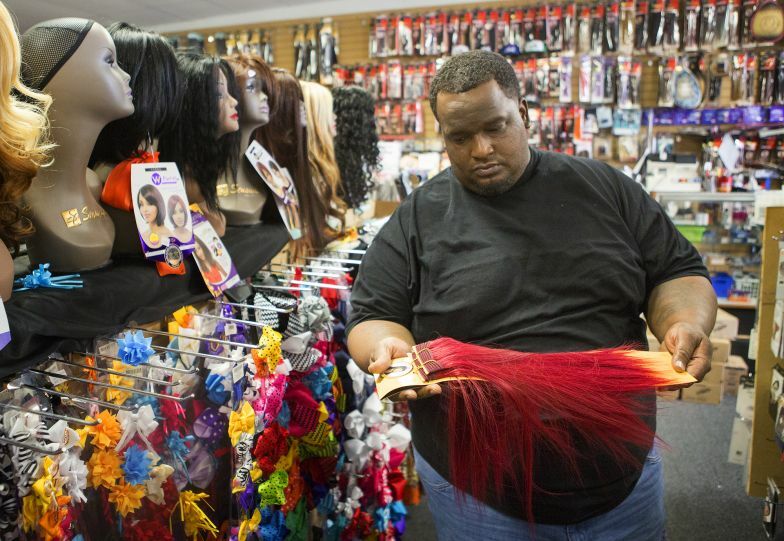 Brashae’s Beauty Supply is the fourth of its kind to get burglarized for high-quality hair extensions in eight days. Owner Don Hilliard estimates that he lost about $10,000 in merchandise on Thursday. Don Hilliard’s west Houston store has nine surveillance cameras, a motion detector, bars on his windows and other security measures. You’d think he was protecting precious jewels or luxury cars. His business on Westheimer actually just sells beauty products, though one of the items has beem deemed a high-value target for thieves: hair extensions. Despite the security efforts, thieves on Thursday stole what Hilliard estimates to be $10,000 worth of hair extensions. Hilliard’s store is one of four businesses selling extensions in Houston burglarized in a little more than a week. In this recent upswing of the thefts, stores are losing thousands of dollars in merchandise. Hair extensions can cost up to $180 per bag. The hair with the hefty tag, professionals say, is an extension made from real human hair with the cuticles intact. The locks last longer and look more natural. One recent hair heist netted $40,000 of merchandise – and that store has been robbed six times. And it’s not just a simple shoplifter stuffing a purse with the product: The weave thieves sometimes move in packs, burglarizing businesses in groups of upwards of eight. “It looks like it’s starting to escalate again, so we’re going to take another good look at it,” Houston police Sgt. Frank Quinn said about the recent trend. Houston dealt with surges of hair extension thefts in 2012. Quinn said thieves often sell the stolen goods out of the trunks of cars. Others hawk them online. The afternoon following his robbery Hilliard walked to the back of his Brashae’s Beauty Supply store, past rows of hair products and extensions, and pulled away a piece of plywood to reveal a small hole in the drywall. Early that morning, two men broke into his business by busting the lock of the empty building next door and cutting a hole in the adjoining wall. Entering through the opening, the men then crawled on the floor and filled trash bags with hair extensions. Don Hilliard looks through a hole burglars cut into the wall of Brashae’s Beauty Supply. Hilliard said Thursday was the fourth time his Westheimer store had been hit. “If they want it, they’re gonna get it,” he said. But now he’s had enough. He is going to stop selling high-quality extensions at that location because they are the real draw for hair thieves. “That’s all they took was high-end,” he said, gesturing to the empty hooks where the extensions used to hang. Quinn said thieves probably latch onto hair theft because they know they can get in and out quickly. “It’s easy to handle, and it’s easy to get away with,” he said. Don Hilliard said he is going to stop selling high-quality extensions at the Westheimer location of his Brashae’s Beauty Supply store after it was hit by burglars Thursday for the fourth time since its opening. “Is the world becoming so materialistic that you have to break in just to steal a pack of hair?” he asked. At 2 a.m. July 30, hair extensions and cash were stolen from Beauty Sensation at Beechnut in southwest Houston. Security camera footage showed as many as eight suspects in two white Ford F-250s descending on the store. One of the trucks backed into the storefront at a high speed in reverse, crashing through the door, according to authorities. The thieves threw items into the bed of the truck, including more than 200 hair extensions, said John Cannon, spokesman for the Houston Police Department. The action was over quickly, said Ronecia Pierre, manager of the Beechnut location, but the suspects still did a lot of damage. “They weren’t in there maybe but two minutes, and by the time we got there they were already gone,” said Deneen Jacobs, general manager for both locations of the beauty shop. Beauty Sensation had been robbed one time before, about four years ago, Jacobs said. After threatening people with a gun, the thieves just took a few purses from customers and left, Jacobs said. This time, Jacobs estimated that $40,000 to $50,000 in cash and merchandise was taken. Then suspects stole about $40,000 worth of merchandise on Saturday from K Y Fashion using a similar technique, said owner Woong Kang. A car described as a white Dodge Dakota truck backed into the front of the shop at West Mount Houston in north Houston, Cannon said. Kang said damages to his store will cost him almost $20,000. The shop has been robbed six times, Kang said. And the day before the burglary at Brashae’s, Sense Beauty Supply at Veterans Memorial in north Houston was hit. Multiple suspects broke in through the rear of the store and stole hair extensions and wigs, Cannon said. The size of a large, gaping hole in the brick wall at the store indicates a vehicle was used to gain entry. Hair supply store owners said they are tired of the stealing. Hilliard, owner of Brashae’s, said criminals should check the classifieds and get a job instead of selling his stuff. “Is the world becoming so materialistic that you have to break in just to steal a pack of hair?” Hilliard said. Previous Article ONYC Hair Reviews: Shayla S.